15 minutes into Jacob Estes’ new movie Relive, I wrote down in my notebook who I thought the killer was. I was right. Even though Estes wants his movie to be a twisty, time-traveling thriller, the narrative is too confined to cliches to ever branch out into something unexpected. It’s like Estes pitched a generic crime thriller, the pitch was rejected, and he added, “Uh, what if time travel was involved somehow?” and Blumhouse said, “Here is your low budget. Make sure none of the extras have any lines even if they see someone bleeding to death.” Instead of using its premise to the fullest, Relive just becomes sillier and more tedious as it continues. 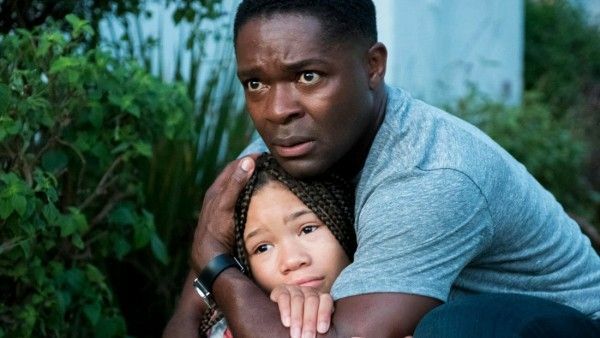 LAPD cop Jack (David Oyelowo) is close with his niece Ashley (Storm Reid), especially since her dad (Brian Tyree Henry) is kind of a screw up. One night Jack comes over to Ashley’s home only to discover that Ashley, her parents, and even her dog have been murdered. Distraught and reeling from their deaths, Jack works to solve the case when suddenly he gets a call from a very alive Ashley. The call is coming from a week in the past, and Jack realizes that he might have a chance to stop the crime before it even happens. The plot moves very quickly past Jack thinking he might be crazy and into accepting that his cell phone plan accepts calls from the past and that changing the timeline must be handled with great delicacy. But jumping into the time travel deprives the film of its emotional power. Unlike the similar Frequency, which is really a father-son story that happens to involve a crime, Relive is a crime story that happens to involve time travel. There’s no urgency to the emotional stakes and the bond between Jack and Ashley lacks texture and depth despite good performances from Oyelowo and Reid. By sticking so closely to the beats of a standard crime drama, Relive loses any individuality its time travel premise provides. What could have been a fascinating look at a guy grappling with grief instead rushes to solve a case the audience has already solved by the end of the first act. The mystery is so bland that it can’t drive the film forward. The story just plods along with intermittent calls from Ashley to move things along. Relive is a movie you’re forgetting about even before it’s over. It’s possible to use a time travel hook to tell an emotional story, but Relive just goes through the motions, uninterested in the emotional stakes and focusing on a crime you’ve already solved. It fails as both a time travel movie and as a crime thriller. Relive does not currently have a release date.